SaudiMac does not recommend buying from non-trusted sellers. Careful from Scams. Here’s a quick update on the Apple iPad availability in the region. The poster said: “Don’t worry, we brought it”. Make sure to contact itechia via their website. Update: If you reserved an iPad then the 16GB model will cost 2,866SR ($764), a bit high but when comparing it to the next store. Photos of the launch on itechia’s facebook group. The ad said “Be the first to get an iPad: be one of the first, unique earners of the iPad. Visit the closest Extra branch today and register your name to get it next week. limited quantities. Special thanks to M. Asim in the Facebook page for visiting Extra and getting some info: 3,999SR ($1,066) for a 16GB iPad WiFi. That model cost $499 (1,871SR) from Apple! And you need to pay 1,000SR in advance. That’s a big rip off. According to 2:48AM the iPad is available at X-Cite. 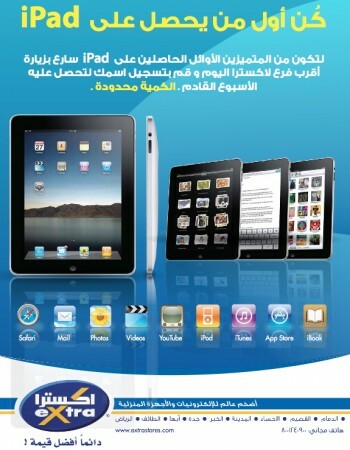 Prices are: 16GB iPad WiFi for 299KD (3,883SR or $1,035)! Via Gulfnews, the first patch of gray market iPads has sold out. The prices were the worst in the Gulf: 16GB iPad for Dh4,500 (4,594SR or $1,225), 32GB iPad for Dh5,250 (5,360SR or $1,429) and 64GB iPad for Dh6,000 (6,126SR or $1,633). Remember that the WiFi only iPad models cost: $499, $599 and $699 for the 16GB, 32GB and 64GB models. 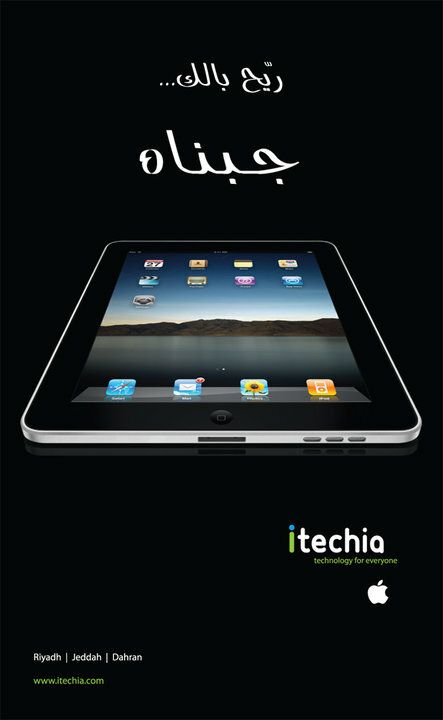 Update 2: itechia’s regular price for 64GB iPad WiFi is 4,999SR ($1,333) which is steep even though it’s less than the UAE price by $300. I think they deserves to be in black list for the mentioned prices. At these prices, it is better to buy it on Ebay. Do not understand how an authorized reseller could apply such margins, that’s a big rip off. Don’t know about extra but itechia usually offer their own warranty. I agree with Mr. Abdul. I brought a Apple TV from Bangalore and it is way cheaper than here. I got a 160 GB Apple TV for around 1150 SAR 1 year back. I don’t remember the price here but was atleast 25 % more expensive. Can you tell me of the price you paid or you going to pay it? i went to extra and they let me pay 1000 payment for 16GB 3999 when i was going back him i passed itekia THEY HAD THE PRODUCT too much poeple i went got my money back and went back to itekia waitted 30 mins to have my 64GB for a better price than extra I LOVE IT THANKS APPLE i paid 399 extra for 3 years warnti they didnt have time to open apple accunt for me can any person help me pleas? I’m gonna do the same, but I’m waiting for visa card to purchase the iPad online. And yes it going to cost me as you stated for the (16 gb). However, I’m going to buy the 32 gb because I did read that the iPad’s software consumes 2 gb from the total capacity of the device. This is insane, the prices are sky high. i would rather order it online or get a pirated one. There is a shop opposite to Jarir bookstore in Jarir Plaza (opposite Mall of Dhaharan) where it is being sold for 3000 SAR. THE APPLE IPAD IS FIRST AVAILABLE IN SAUDI ARABIA WITH EMAX ELECTRONICS FOR THE CHEAPEST PRICE. SHOWROOMS ARE LOCATED IN BAWADI SITTEEN, SAWARY MALL – TARIK MALLIK ROAD, CENTREPOINT – SULTAN ROAD, JEDDAH. EMAX ELECTRONICS IS THE LARGEST ELECTRONIC CHAIN IN THE ENTIRE MIDDLE EAST. it doesn’t matter who got it first now. I have 3 64gb 3g models coming over the next two weeks. I will charge 5300SR for each one. let me know if you want. I live in Saudi Arabia Jeddah and im interested with the new apple product ipad I wanna buy it but its freakin expensive here it costs about 3000s.r…its almost half the price on ebay 499$ about 1800 s.r…. so what should I do? Between may 5th and June 5th. I will have four ipads coming to my mailbox. Reserve yours now. Free DHL delivery if you are not in Dhahran, once payment is recieved. Price is 5300 Saudi Riyal. For whom are interested! I receive orders to buy iPad wifi & 3G. The iPads will be purchase from Apple stores in United Sates of America directly. For that selling it to you is going to be less the Saudi market. P.S. the full payment for the iPad is going to be at the day of receiving it. iPad Does 3 G work? If I buy a32 Gb iPAd Wifi+3G from USA can I use the 3G features outside USA? Will it be locked like iPhone? Please opine and share your experience. I have an extra one here in Dhahran, let me know if you are interested. Brand new and sealed by Apple. send me an email if you are interested, salkhabti@gmail.com. The only challenge would be cutting the simcard which i got right from the first time! thank god… other than that, i suggest you go buy at any price. I have so far shelved my macbook air and Imac for this beautiful thing. If i buy it from australia will it work in the uae? or will it be locked? I believe thats always better if we buy a product from local market, so that we may get some assistance on that! i know but its much cheaper from there.I have to be sure that its definatly not locked. My company have brand new Apple Iphone 4G 32GB instock and is available for just $500 usd. if you buy 3 units you will be giving 1 unit of Apple iphone 3Gs 32GB for free. Contact us via Email: jonacomm@yahoo.com and we will send you our company website for more details on how to order from us. I will wait for your email ASAP. Does anybody have an idea when an Arabic keyboard will be inbuilt in iPad OS?! I could not us even Al-Mawrid dictionary even using special apps. Go to the app store and search for Arabic keyboard and download and install it. follow the instructions on how to use it. iPad currently does not support arabic. Available iPad1 16gb 3g+wifi at an amazing price for whole sale only. Let me know if anyone interested. I am an apple wholeseller and have, for sure the cheapest prices. Feel free to contact me at your conveneince. It is coming the Christmas all the items are in promotions! buy any one item will get one more free gift! the last chance of 2011 !